Bird boarding minding your pet birds while you're away. 30+ years bird ownership. For your feathered friend we offer bird minding services in a safe and happy environmen­t in an occupied home. Our 'bird house' is located on the North Shore, Auckland. I have 30+ years experience with birds including budgies, lovebirds, canaries, cockatiels, barrabands, doves, pigeons, galahs, lorikeets, corellas, conures, eclectus parrots, indian ringnecks, alexandrines. I've also helped with bird rescue. Our friendly home offers you boarding for your small to medium pet birds while you're away. For peace of mind we can send text or email updates to you. Please don't hesitate to contact me for any information or queries at all. I know how hard it is to go away and leave a pet bird behind. You are welcome to visit our 'bird house' before booking. We cannot give Janine enough praise for the care she took in looking after our Cockatiel Coco! We recently went away on holiday and was quite nervous about leaving Coco behind. Believe it or not, we usually take her along! Janine sent regular updates and took care of her as if she was her own. She also provided much appreciated advice. Thank you so very much Janine. Highly recommend seeking out her services if you're looking for a reliable sitter for your feathered family member. Trixie loved her stay. She even learn't to eat veggies there which was great. She now eats carrots and silverbeet at home. Thanks so much for looking after her so well and sending me photo updates while I was away. Thank you Janine for taking such good care of Nippy. He has had a wonderful holiday and been so well looked after, you will definitely be seeing him again when I next go away. I highly recommend Janine. Janine took great care of our little boy, Scruffy, for a period in July/Aug. He is quite an old parrot who has hardly left the family home his whole life so I was anxious. But Janine was very understanding and even went as far as sending daily updates on how he is going. I loved receiving these detailed emails, and the odd photo too. It put any worries at ease and we were 100% sure he was in great hands. I would be grateful for Janine to look after him again in future if needed. Thank you. Toni. I would highly recommend Janine for minding your bird while you are away. I felt totally at ease leaving my two budgies in her care for 3 weeks. She is very knowledgable and gave me some great advice and tips for caring for my budgies. Janine is very friendly and easy to deal with and flexible with drop off/pick up times. I will definitely use her service again next time I go on holiday. Janine is the most loving person and obviously incredibly experienced with birds. Our little Burt spent a week with Janine and her lovely daughter Eloise. When we got back Burt was so happy she was reluctant to leave! This is where Burt will be staying from now on if Janine has space, I was so relaxed to leave her there and it was easy to deal with Janine and most affordable for a worry free holiday for our beloved little Cockatiel. Thanks so much Janine, you're AWESOME! 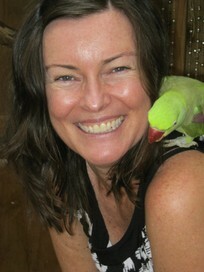 Janine is a lovely and caring lady who truly loves birds and treats them very well. After spending 2 weeks with her, my baby came back home very happy and chatty. Of course, her house is going to be his summer holidays from now on :) I highly recommend her.